Lamborghini - I Say Ding Dong Shop - Buy Stickers, Decals & Unique Automobilia. Lamborghini & Agip Servizio A Service Sticker. 3". Lamborghini & Agip Yellow Service Sticker. 3". Lamborghini 'S' Logo Laser Cut Self Adhesive Car Badge. 2 sizes. Lamborghini Gallardo Cut Text Sticker. 11.5". Lamborghini Italia Tricolore Style Stickers. 2" Pair. Lamborghini Laser Cut Text Self Adhesive Car Badge. 6.25"
Lamborghini Logo Circular Laser Cut Self Adhesive Car Badge. 25mm. Lamborghini Parking Only. London Street Sign Style Sticker. 3", 6" or 12". Lamborghini Red & Black Shield Shaped Tractor Car or Window Sticker. 80mm. 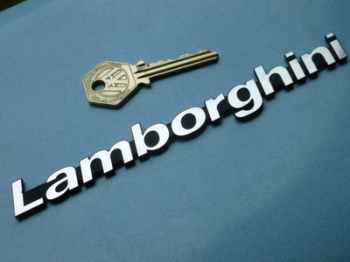 Lamborghini Script Style Laser Cut Self Adhesive Car Badge. 2.75" or 5". Lamborghini Shield Laser Cut Self Adhesive Car Badge. 2.5". Lamborghini Shield Style Laser Cut Magnet. 2.5"
Lamborghini Shield Style Sticker. 8". 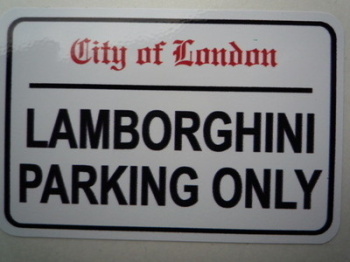 Lamborghini Text & Logo Style Window Sticker. 11". Mid-Life Crisis Humorous Number Plate Dealer Logo Cover Stickers. 5.5" Pair. Modena Italia Crest Window or Car Body Sticker. 2.75". Nardi Personal Oblong F1 Ferrari Style Stickers. 6" Pair. Nardi Selci Lama, Perugia - Italy Oblong Sticker. 17.75". Nardi Selci Lama, Perugia - Italy Oblong Stickers. 8" Pair. 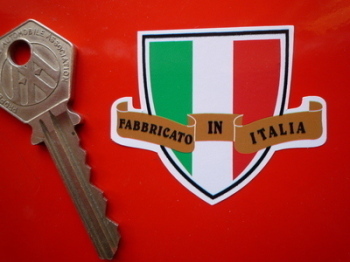 Scuderia Veloce Shield and Scroll Style Sticker. 5.75"
Supercortemaggiore 'Attenzione' Service Sticker. 3". Supercortemaggiore 'benzina Italiana' Stickers. 2.5" Pair. Supercortemaggiore 'Benzina Italiana' Window Stickers. 54mm Pair. Supercortemaggiore Oblong Stickers. 4.25" Pair.